The Montessori Children's House of Hyde Park is excited to offer a variety of enriching extracurricular activities. In keeping with the high standards of Montessori Children's House of Hyde Park, we have sought out top franchises and educators to host these clubs for our students. Crafts Club: (Ages 6 & up) - Our club will turn everyday things into unexpected treasures! Sample projects include: Homemade fizzy bath bombs, recycled bottles transformed into planters, and picture frames becoming bird feeders. Let’s get creative, let’s get crafty! 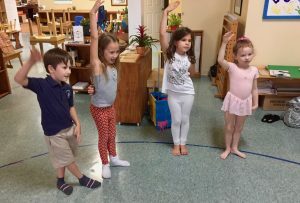 Yoga Club: (Ages 4 through Lower Elementary) - Combining the active practice of yoga and the calming practice of meditation, we give students a real toolbox to use every day to succeed! Yoga positively affects academic performance and social skills such as making friends, developing compassion and managing stress. Move your body, have fun and reduce anxiety! Guitar Club: (Ages Lower Elementary & up) - We will apply theory topics and guitar technique through entertaining group games as well as exercises on the instrument. Your child will be able to hold an educated conversation about music and also problem solve at home, outside of class. At the end of the semester, we will put on a final performance for family. The class will play songs as a group, and you can sing along! Each student will also have an option to perform at our MCH graduation ceremony. Tennis Club: (Ages 4 through Lower Elementary) - Learn the fundamentals of tennis. Play with a partner and rotate among friends. All equipment (rackets, balls, nets) will be provided. Individual skills, foot movement, hand-eye coordination, arm strength and agility will be emphasized. Love, Deuce, Ace and more! Drama Club: (Ages 5 & up) - This is a continuation from Fall Semester. No new enrollees will be accepted. Stay tuned for our end-of-year production. Encore! Soccer Club: (Ages 4 through Lower Elementary) - We utilize creative and imaginative games to focus on basic soccer skills like dribbling, passing and shooting. We also highlight a positive character trait each session such as respect, teamwork and appreciation. This club focuses on individual skills, fitness and sportsmanship. Young Engineers Club: (Ages Lower Elementary & up) - Integrate theoretical material and scientific principles into a LEGO based project. Encourage creative and inventive thinking. Learn angles, physics, gravity and turn into a young engineer! The theme this semester is Classic Mechanics. Learn all about belts and gears, transmissions, speed and power. You will build a windmill, an elevator, a crane, a washing machine and more. Dance Pop Star: (Ages Lower Elementary & up) - If you ever saw a music video and thought “I wish I could do that!”, then this class is for you! Dancers and performers will learn extreme styles, skills and confidence to perform like an MTV star. Using your favorite pop music and incorporating choreography blending hip hop, funk and jazz, dancers will be inspired to reach fame! You will create your own music video! At the end of the semester, parents are invited to a gala performance by our students. Magic Club: (Ages Lower Elementary & up) - Learn the history of magic, famous magicians, sleight-of-hand and illusions. Each week, after a performance by the magician, certain tricks will be divulged to our students, and they will spend time perfecting the magic. At the end of the semester, the young magicians will perform their new-found tricks for our parents. Hocus-Pocus! Can you focus? Mad Science Club: (Ages 5 & up) - Work in a real “lab”. The theme this semester is Natural Wonders. Students will experiment with how new earth is formed and how rocks are created. Investigate cells, the basic building blocks of life, and get into some human body processes. We will delve into our world's many different ecosystems and environments both under the sea and on land. Explore the differences in herbivores and carnivores dinosaurs. Students will participate in a mini dinosaur excavation and make a cast of a dinosaur tooth to take home. Each session will be filled with hands-on experiments and amazing take-home projects. Dance Combo Club: (Ages 4 though 7) - An upbeat class for boys and girls who love to shake it. Dancers will explore multiple styles of dance including Hip Hop, Ballet, Jazz and Acro. Imaginations come to life as dancers use props, such as scarves, hula hoops and top hats to learn how to express themselves creatively. Dancers will shine as they are taught a variety of choreographed dances. At the end of the semester, parents are invited to a special performance by our students. Chess Club: (Lower Elementary Students & Up) - Learn great openings, winning strategies and all the tools required to excel at Chess. Learn patience, focus, and discipline. Gain a comprehensive knowledge of the habits and training required to win. Play among your friends. Strategize! Our After School Clubs are held at convenient times, in the safety of our own premises, and at low rates. After school clubs will start at 3 pm and last 60 minutes. The Young Engineers Club and the Craft Club, however, will last 75 minutes per session. All clubs will meet once per week and will last the entire semester (12-16 sessions) except for our Drama Club, which is being continued from the Fall semester. Our Drama Club, Dance Clubs, Guitar Clubs, Magic Club and Soccer Club will have a show or exhibit for parents and guests at the end of the course. All clubs are limited in size. We target 10-15 students per club, depending on the club. However, some clubs, like the Guitar and Tennis Club, will be severely restricted and kept at a small size to better serve the students. All clubs will be filled on a first come basis. Clubs will be cancelled if we do not get enough student interest to fill the minimum number of slots required by the instructors for each club. A non-refundable deposit of $100 per club per student is required at the time of registration. This deposit will be applied towards the cost of the club. You will be charged for the entire club, once the club begins. There will be NO refunds after the club begins. Refunds will NOT be issued for missed sessions or if a child drops out during the semester. All forms, along with deposit payments are due Monday, November 26th. In addition to our current programs, we are always evaluating new offerings that are of interest to our students. Please don't hesitate to contact us with programs that your children would like to see added to our list.